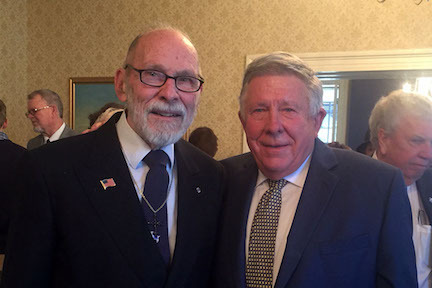 We begin this month's column with the sad news of the death of our classmate Denis Joseph William Bell, CAPT, USN (Ret.) on 27 February. His widow, Theresa, may be contacted at 9940 Red Rock Court, San Diego, CA 92131. Lee Tillotson noted that "Taco" Bell was a bit of a legend at Fightertown. He was a tactics instructor at the F-8 RAG and one of the first Top Gun adversary pilots. He commanded the last operational F-8 squadron. 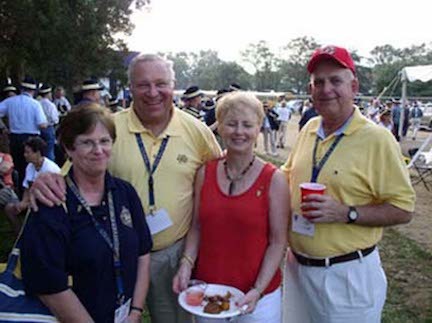 The USNA Alumni Association publishes a monthly electronic newsletter called WaveTops. 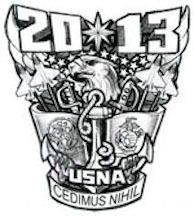 The current and past issues can be seen at www.USNA.com . 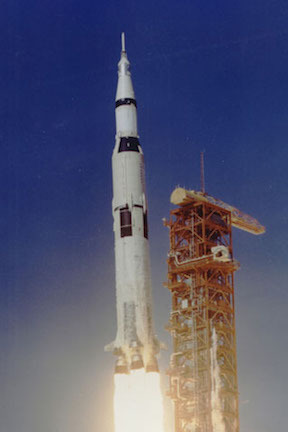 The February issue is highlighted by an article written by Steve Coester about NASA's missions to the moon and his participation in the space program. Titled "Launching Men to the Moon," it's a very interesting, fully illustrated article, and I encourage you to take a few minutes to read it. 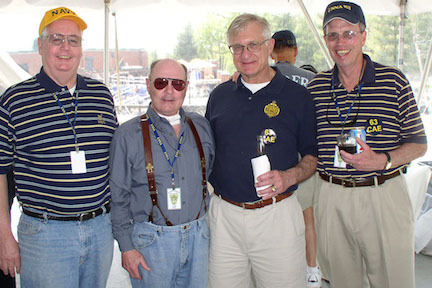 You can see it by clicking HERE or by going to www.USNA.com, scrolling to the bottom of the home page, and clicking on WaveTops to see other past issues. Bob Harper sent this note and a photo of himself with Pete Carrothers in late February. Pete and Nancy Carrothers were in Annapolis for the funeral of Captain Phil Ryan (USNA '50). Phil was a top athlete, having lettered in Football (Team Captain), Lacrosse (All-American) and Basketball (All-Star). 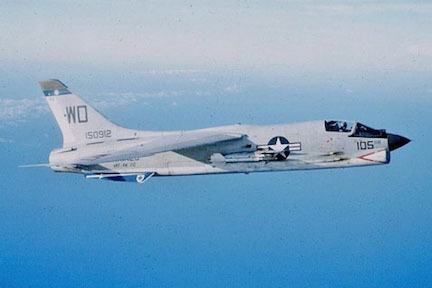 Pete was a member of Phil's RVAH-7 Squadron, flying the Vigilante for reconnaissance in Vietnam. Anne and I joined them at the funeral and reception, where Pete was invited to share some of the squadron humor with the guests. John Pfeiffer tells us about a high-speed hobby he shares with his son. 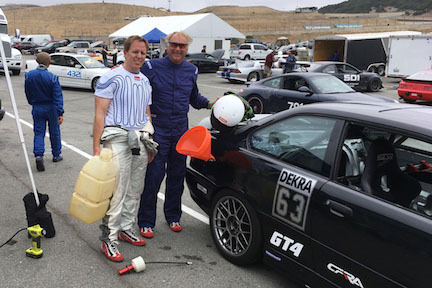 This is a photo of me and my son James (USNA '93) at the Laguna Seca Raceway near Monterey, CA, recently. James began tracking cars when he was in Norfolk and Annapolis for duty. I joined him on and off from California until he moved 10 minutes away from us in Monterey over the hill in Carmel Valley. 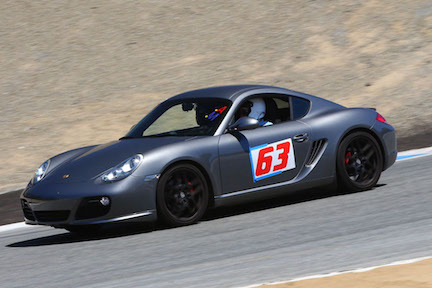 We share the BMW on track days and hope to add the second car (Porsche Cayman S) soon. Note the prominent number 63 on both cars. Back east we ran at Watkins Glen, Summit Point, and Virginia International Raceways. In California it has been Laguna, Sonoma, Buttonwillow, and Thunderhill. Obviously, James as a retired F/A-18 jock is somewhat faster than I am and he refuses to give me an old-age or "black shoe" handicap. About my other activities: I am in my 23rd year as USTA and ITA Referee/Umpire and in my 29th year as a Blue and Gold Officer. No plans to retire! 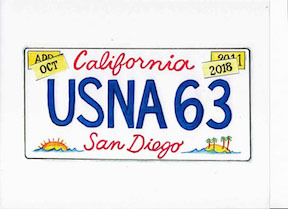 Registration for our 55th Reunion this October opened in early March, and many people have already submitted their completed registration form and payment. The form and other information are in the Reunions section of our web site and can be seen by clicking HERE . Please register soon! Some of our classmates have asked whether the Class of 2013 will be part of our Reunion. For a number of reasons, participation by the Class of 2013 is an area the Committee deferred until after getting the reunion registration package out. 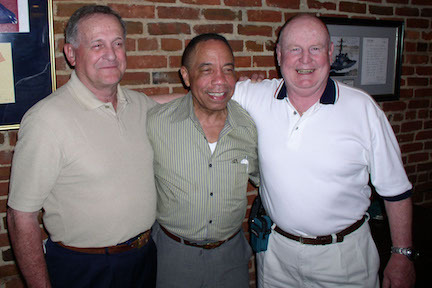 The Class of 2013 decided to have their 5th Reunion in Annapolis, so there will be no formal "joint '63-'13" reunion. 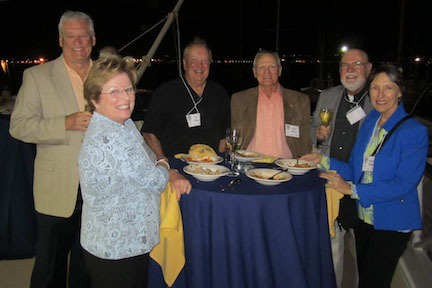 However, our intent all along has been to invite the Class of 2013 to those 55th Reunion events where it is feasible. The task before us now is to determine which events lend themselves to their participation. We will let you and the Class of 2013 leadership know what we come up with in the near future. 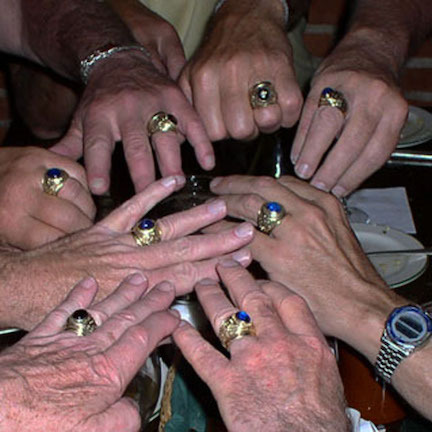 We have had a lot of fun and camaraderie at our previous class reunions. 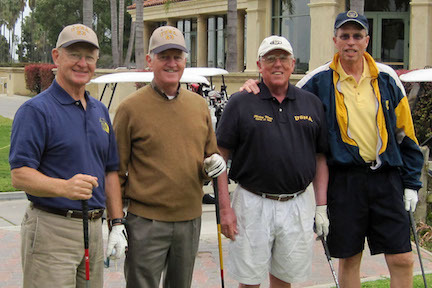 To spark some memories, here are a few images from the 40th, the 45th, and the "Mid-Term" reunion in San Diego in 2011. Don't miss our 55th! That's all for now. Don't forget to send some news to be shared with our classmates!